Three children were taken by the authorities from Roma families like this one because they had fairer skin and hair than their parents. Image courtesy of Wikimedia Commons. In Greece, a Roma child was taken away from her family because she didn’t look much like her parents. DNA testing revealed that she was not their biological child and so the authorities thought that she had been kidnapped. Turns out, she hadn’t been; her biological mother had given her up because she was too poor to keep her. Something similar then happened in Ireland where two Roma children were removed from their families because, again, they did not look like their parents. This time, the DNA test results showed that the children were with their biological parents. The children have been returned to their families. These events are disturbing for a couple of different reasons. The first is the strong whiff of prejudice associated with them. 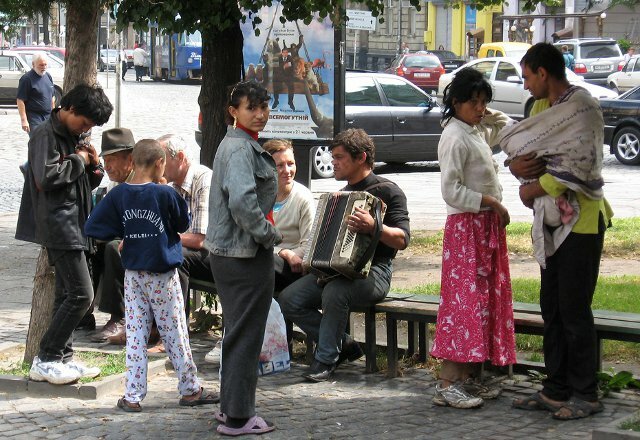 The authorities appear to have assumed that these children were kidnapped because they were living among the Roma (more commonly known as gypsies). I haven’t heard of any children being removed and tested from any other communities. And believe me, if these kids were taken only because they looked different from their parents, lots more kids would have been removed from their families. Imagine that the mom was out of the picture in the family portrayed in this video (as appears to be true for one of the Irish families). One of these twins doesn’t look much like dad at all and, if the same sort of logic were applied here as was applied to the Roma, then this child would be taken away and tested. But of course, he wouldn’t be because he wasn’t Roma. In the case in Greece and both cases in Ireland, the children were taken because they were blonde and fair and the parents had darker hair and skin. Parents having children with lighter hair and skin is actually pretty common. Sometimes the child’s hair and skin darken over time but sometimes it just stays much lighter than the parents. And though less common, the opposite can happen too. Fair parents can have kids with darker hair and darker skin. These are not the only traits where this occurs, either. Parents with brown eyes can have blue-eyed children and despite what you may have learned in high school, the reverse can happen too. Blue-eyed parents can and do sometimes have brown-eyed kids. The same is true for red hair. There are so many cases of parents with darker hair and skin having fair-skinned children with red hair and freckles that there are even milkman jokes about it! And yet, the Irish authorities aren’t searching homes in Dublin, looking for redheads in families without red hair. They aren’t even looking for the rarer case of red-haired parents who have a child without red hair. No the authorities focused on Roma children who looked different from their parents. Given that they only looked at Roma families, maybe a better understanding of dominant and recessive genes and other fundamental genetics concepts wouldn’t have stopped this all from happening. But still, maybe it would have made it a bit less likely.